We will have the first anniversary party in 13th of March. Join us! The detail of the event will come soon! At the moment, I'm doing the Sunset Osaka Bicycle Tour in 13th and 19th. 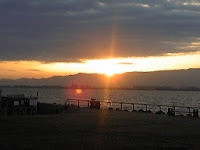 People know that the Osaka is the beautiful sunset place from the ancient days. Some place named like Sunset hills(Yuuhi ga oka) because people see the gorgeous one. During the sunset time, we might do Yoga or have some Japanese tea or coffee as we like to do. Wacth the sunset over the Osaka gulf (Seto inland sea) and Rokko mountain. Send us your information by reservation form. Just next to the Yacht harbor, you can see the Hundertwasser's works of Osaka City Treatment Plant.